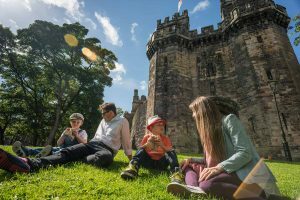 There is exciting news for Shakespeare lovers this week at Lancaster Castle. After Demi-Paradise Productions announced their retirement, many feared it would be the end of Shakespeare at the castle. However, Attic Door Productions is boldly taking over the reins and their show, The Two Gentlemen of Verona, will be performed between April 18 and 29. Company director Ben Muir thinks it’s the perfect fit for the company, having already performed in the castle staging murder mysteries and other family productions, such as their sell out performances of Alice in Wonderland and Wind in the Willows. The show is actively seeking to use local talent with local artist Sazi Harrop designing their production poster, along with casting actors and actresses from within the Lancaster and Morecambe. The Two Gentlemen of Verona runs from April 18-29 (no shows on Sunday and matinees on Saturdays). Ticket prices range from £12.50 – £22.50. Call 01524 64998 to book now.